Some heating systems can be susceptible to noise problems as a result of baked-on corrosion and limescale deposits on boiler heat exchangers. Whilst power flushing may cure this, on some systems it may be an ongoing problem. The addition of one litre of SYSTEM-HUSH, together with SYSTEMSAFE-DM, is recommended to cleanse the heat exchanger during normal system operation. SYSTEM-HUSH may be left in the system without draining. 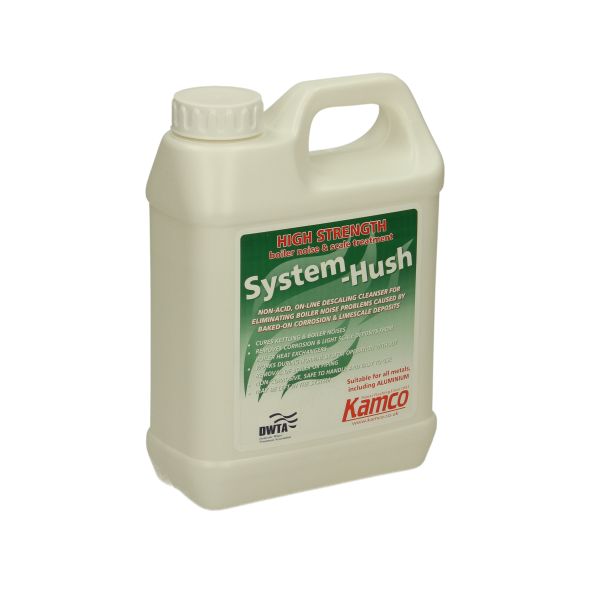 SYSTEM-HUSH works at a near neutral pH, taking rust, corrosion and light scale deposits into solution, without formation of particulate matter to cause blockages and damage pumps. Boiler heat transfer surfaces are left clean, restoring efficiency, and boiler noises are eliminated. SYSTEM-HUSH may be used with all metals commonly used in heating systems, including ferrous metals, brass, copper, aluminium and galvanised steel. It does not cause deterioration of metallic or non-metallic components when used as recommended, enabling it to be used on older systems which may be in too poor a condition for aggressive descaling chemicals. Removes corrosion and baked-on light scale deposits from heat exchangers. Works during normal system operation without removal of boiler or piping. May be left in the system.